During Road to the Horse 2019, Craig Cameron was proud to announce the inclusion of his son, Cole Cameron, in the Road to the Horse 2020 Wild Card competition. Cole will be joined by another Wild Card who will be selected by the Mustang Heritage Foundation from mustang trainers who are competing in a 2019 or 2020 Extreme Mustang Makeover competition. The third Road to the Horse 2020 Wild card competitor is yet to be announced. With Wilson mounted in her English saddle, Dowers in his Western saddle, and James in his Australian saddle, all three Road to the Horse 2018 competitors displayed remarkable horsemanship, staying true to their roots and true to the horse. All different, but all undeniably successful. Show jumping sensation and defending Road to the Horse 2017 World Champion Vicki Wilson proudly brought the Gist Silversmith’s Road to the Horse 2018 World Championship buckle back to her homeland of New Zealand. Wilson secured her place in Road to the Horse history as the only horsewoman to have captured two World Championship of Colt Starting titles. Australian horseman, Dan James was honored with the Jack Brainard Horsemanship Award for his exceptional horsemanship skills which he portrayed throughout the entire event. A recognition that is hand-selected and awarded by legendary horseman Jack Brainard. Wilson was not only the first competitor from New Zealand, she was the first competitor from an English discipline to not only compete but to walk away with the coveted World Championship of Colt Starting title. Wilson’s Road to the Horse journey was far from scripted. After dislocating her left shoulder during Round 1, many fans were unsure if she could even continue but she didn’t just continue, she shined. Wilson may have had to alter her strategy with her 6666 Ranch bred colt Boon River Lad, who she fondly named ‘Kentucky’, but she continued with the grace and grit of a champion. Rachelle Valentine selected the 6666 Ranch horse gelding Playin A Seven, this playful grey gelding soon became a fan favorite. Sarah Dawson selected Smart Hunt and California cutting horse trainer Kate Neubert claimed the prestigious Jack Brainard Horsemanship Award riding Sixes Captain. “It’s an honor. I am so proud of my horsemanship, to win an event like the NRCHA Futurity, then to win Road to the Horse and tie the two together, that’s just huge” stated the emotional Dowers right after his win. When asked what helped him take the title, the answer was easy for Dowers, “Being myself and staying true to what I do.” Equaled in class and charisma, the 6666 Ranch colt Seven Attraction carried Dowers to his first World Championship of Colt Starting title. Winters won Round One displaying outstanding horsemanship and incurred no penalties. Although it was not a popular choice, Anderson did incur a score and time penalty after a Violation of a Rest Period for his colt. This resulted in both a penalty to Anderson’s score in Round Two and a reduced working time in Round Three. Road to the Horse has always placed, and always will place the horse as the first priority. Not only did Dowers walk away with the World Championship, he was also awarded the Jack Brainard Horsemanship Award. Awarded and presented by Jack Brainard, this award goes to the horseman or horsewoman that excels in their power of observation to correctly analyze the best approach and then apply that method as smoothly as possible for the horse’s best interest. Road to the Horse was guaranteed to make history and it did not disappoint. 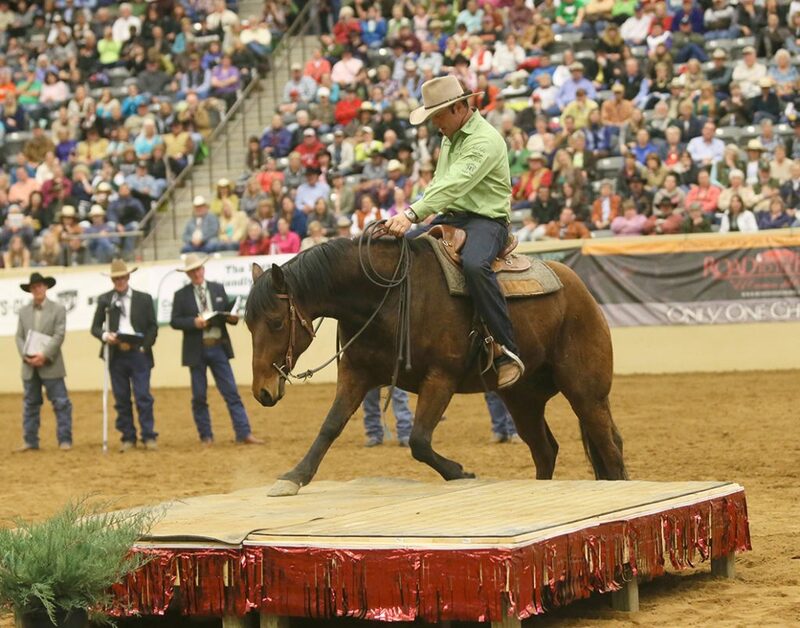 Fans travelled from around the world to witness master horseman Chris Cox accumulate his unprecedented fourth Road to the Horse World Championship. A sold-out crowd in the Alltech Arena at the Kentucky Horse Park was on the edge of their seats while each competitor piloted two 6666 Ranch bred geldings through the final obstacle course, chasing a record setting $100,000 purse. Barbara Cox served as Cox’s Pen Wrangler throughout the competition and his children, Charley and Case, joined him during his riding demonstration at the event. His young daughter Charley Cox had the privilege of presenting her father with the 2015 World Championship Gist buckle. Fans watched Trevor Carter take the 2015 Ram Trucks Wildcard Championship title prior to the main competition. Carter and his 6666 Ranch bred gelding Royal Wall (aka Sailor) were also rewarded Fan Favorite honors after thousands of fans cast their votes over 24 hours. Both Trevor Carter and Road to the Horse 2014 World Champion Jim Anderson had colts that challenged their colt starting skills, which treated the fans to an amazing display of horsemanship throughout the weekend. It was a photo finish at the Kentucky Horse Park after a historic showdown, which brought the crowd to their feet as a Cinderella story unfolded. Canadian Wild Card Jim Anderson captured the Ram Trucks Wild Card Championship and ultimately the 2014 World Championship of Colt Starting title. Fellow competitors Dan Steers (Australia), Antoine Cloux (Switzerland) and Jonathan Field (Canada) were close behind Anderson in a finish that came down to the very last round. Jonathan Field was honored with the Jack Brainard Horsemanship Award for displaying exceptional horsemanship and always acting in the best interests of the horse. Fans at Road to the Horse witnessed the largest ever American Quarter Horse Association Remuda to run at Road to the Horse, with twenty-one iconic horses from the 6666 Ranch. After the 2014 competitors made their selections, the Wild Cards for the 2015 competition were announced and made their picks from the AQHA Remuda from the 6666 Ranch. Returning Wild Cards for 2015 include Sean Patrick, Mary Kitzmiller, Trevor Carter and James Cooler. They will be joined by newcomers Shamus Haws, Dan Keen and Bobby Knight. Australian horseman and clinician Guy McLean struggled to hold back the tears as he thanked Road to the Horse Producer Tootie Bland and all those who had helped him accomplish his dreams of a second World Championship of Colt Starting. Guy McLean was not the only one struggling to hold back the tears. A sold-out crowd in the Alltech Arena at the Kentucky Horse Park was on their feet in applause, doing the exact same thing. Fellow competitors Dan James, Obbie Schlom and Sarah Winters made it a photo finish as the event made the move from Murfreesboro, TN to Lexington, KY for the very first time. Cowgirls Obbie Schlom and Sarah Winters were placing first and second after the first three rounds of the World Championship of Colt Starting. Dan James had a gelding that tested his horsemanship skills through the Obstacle Challenge and like a true horseman James always put the best interests of the horse first. It was the shout heard around the world as Guy McLean, covering his face with his hands, threw his arms in the air and grabbed teammate Dan James after hearing Team Australia announced as winners of Road to the Horse International March 11 in Murfreesboro, Tenn.
James of North Arm Cove, New South Wales and McLean of Hervey Bay, Queensland, went into the final round of competition, the challenging obstacle course, in a close race with Team USA, made up of veteran clinicians Craig Cameron of Bluff Dale, Texas, and Pat Parelli of Pagosa Springs, Colo. Team Canada, consisting of British Columbia horsemen Glenn Stewart of Baldonnel and Jonathan Field of Abbotsford, were no slackers, either, having taken on two challenging horses to make it to the obstacle course. James, who also purchased his horse following the event, said he was shocked. “It was so close,” he said. “I really didn’t know how it would go, but this was an amazing competition.” Both trainers were awarded with the AQHA Traveler award for their win and both purchased their horses. It was, without a shadow of a doubt the most electrifying event in the eight-year history of Road to the Horse – The World Championship of Colt Starting. The nation’s three largest equine clinicians shared the dirt for the first time February 25-27 in front of sold-out crowds at the Tennessee Miller Coliseum in Murfreesboro, TN. Pat Parelli brought his horsemanship Savvy. Clinton Anderson displayed his Downunder thunder. But in the end, it was the earnest determination of Texas cowboy Chris Cox that won the judges’ favor and earned him his third Road to the Horse championship title and the first Legends title granted by the event. Cox received a $10,000 winner’s check, a custom-made Martin Saddle, a giclee by artist Susan Edison, spurs by bit maker Daryl Davis and Road to the Horse Legends World Champion gold and sterling silver Gist Silversmiths belt buckle from Road to the Horse founder/producer Tootie Bland. AQHA, the official remuda sponsor, presented the Traveler Award to the esteemed 6666 Ranch to honor them for breeding Cox’s colt, Perfect Performance. The award is named for the AQHA foundation sire who was inducted into the American Quarter Horse Hall of Fame in 1994. 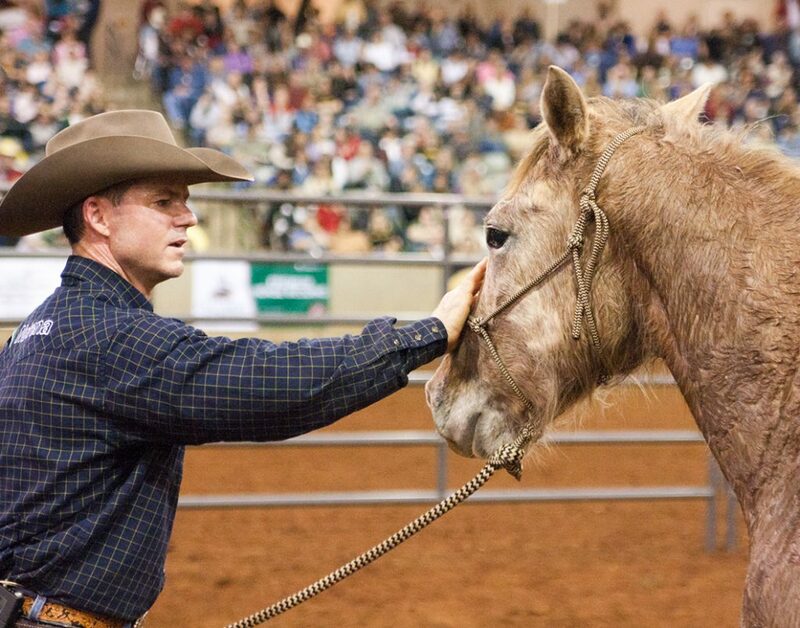 Craig Cameron of Bluff Dale, TX was crowned the 2010 World Champion of Colt-Starting in Murfreesboro, TN March 7, 2010. Richard Winters, Cameron and Ken McNabb competed for the coveted title in a display of supreme horsemanship and at the end of the day, Cameron, known as the original cowboy clinician, came out the winner of the seven-year-old event which gives three top clinicians a little over three hours over two days to gentle three unbroken colts using their own styles of natural horsemanship. “Every time I’ve competed at Road to the Horse, I’ve left a piece of my heart in the arena. Now I’m getting a little bit of that back. I truly believe winning Road to the Horse is going to change my life. I am 61 years old and now I am a world champion and no-one can ever take that away from me. This may be the best day of my life,” said Cameron. Besides the coveted title of Road to the Horse 2010 Champion, Cameron received a check for $10,000 from Road to the Horse producer Tootie Bland, a memorial Steven “Dookie” Bland trophy saddle provided by Martin Saddlery featuring conchos by Gist Silversmiths, a handcrafted Road to the Horse buckle by Gist Silversmiths, a CSI saddle pad, and an original “Blue Horse” painting by artist Henry Patton which was featured as the cover image of the event’s souvenir program. Richard Winters of Ojai, California was crowned Road to the Horse Champion in Franklin, TN March 15, 2009. Winters, John Lyons and Tommy Garland competed for the coveted title in front of a sold-out crowd of 6,000 spectators including guests from as far away as Finland, France and Paraguay . Winter’s explained to the live crowd at the event that his training approach was to train his chosen 2006 AQHA bay colt, Plenty Brown Hancock, just like he would in any other setting on any other day. For Winters this included riding his colt in the obstacle course and freestyle performance in a halter rather than a bridle and bit, making him the first champion to ride his colt to victory bitless. In another Road to the Horse first, Winters asked for a calf to be let into the arena during his freestyle. He explained it is important to him to cultivate curiosity and confidence in his young horses by introducing them to new experiences such as tracking cattle. Winters also received a check for $10,000 from Road to the Horse producer Tootie Bland, a memorial Steven “Dookie” Bland trophy saddle provided by Martin Saddlery featuring conchos by Gist Silversmiths, a handcrafted Road to the Horse buckle by Gist Silversmith, a CSI saddle pad and an original painting by artist Peter Grant entitled “On the Road” which was featured as the cover image of the event’s souvenir program. Defending champion Chris Cox emerged victorious at his second Road to the Horse competition with his win Sunday, March 2, 2008, at the Tennessee Miller Coliseum, making him the only competitor other than Clinton Anderson to win back-to-back championships. Along with taking the title, Cox also received a $15,000 donation toward his charity, The Imus Cattle Ranch for Kids with Cancer from Quest and Fort Dodge Animal Health. The winning horse was WR Shinosmoke by Shining King Cody out of Alamosa. The competition was neck-and-neck until the moment the winning envelope was opened. Top judges Robert M. Miller D.V.M., Jack Brainard, James Gholson, Terry Crofoot and Toni Warvell took in the action both days, and even into the last minutes of competition felt it was any man’s game. The Arkansas-bred Wood Ranch horses proved to be the challenge Boss Wrangler Thomas B. Saunders V was looking for. Competitors Tommy Garland, Ken McNabb, Mike Kevil and Cox tested their knowledge and horsemanship skills on four three-year-old American Quarter Horse geldings. The exhibitors and competitors enjoyed this year’s selection of horses. Chris Cox was named champion of the 2007 Road to the Horse Sunday March 4 at Murfreesboro’s Tennessee Miller Coliseum. With Cox’s win, $15,000 will be donated to the national chapter of the Future Farmers of America (The Wahl Charity Challenge money) and Cox will head home with a memorial saddle, buckle, and model of his winning horse, Commander Otoe King, a 2004 AQHA sorrel by Paseo Pronto and out of Otoe Windy Commander. Fans and judges seemed to agree on the winner—but the competition was fierce. At the end of day one, any of the clinicians had progressed with their horses and had the opportunity to win. The sell-out crowd erupted when they heard the results—Stacy Westfall is the 2006 winner of Road to the Horse, the colt-starting challenge held February 25-26, 2006 in Murfreesboro, Tenn. Westfall was the first female competitor, challenging well-known cowboy clinicians Martin Black, Craig Cameron and Van Hargis. Westfall bonded with her horse, Doctor T Tari-whom she calls “Popcorn.” She offered to buy him after her first competition round on Saturday. After the competition, she purchased the three-year-old colt sired by Docs T Peppy and out of Ms Tari Babe. The horse was raised on the Cornelius Ranch, in Blountsville, Alabama. The competition was fierce, the horses were challenging and the 5,000 spectators who filled the Tennessee Miller Coliseum in Murfreesboro, TN on March 5 and 6, 2005 loved every minute of it. Heralded as “The Greatest Horsemanship Event of the Year” those lucky enough to get a ticket to the sold-out event had a ticket to horsemanship history. With a tough draw of horses, Clinton Anderson, Craig Cameron and Van Hargis worked for every training success and showed the appreciative crowd the depth of their skills. Ultimately, Australian clinician Clinton Anderson was crowned the winner of the event, but the true winners were the horses and the audience who were treated to the skills of all three clinicians. Anderson and his colt were proclaimed the winners of El Camino del Caballo, a two-day challenge that featured Anderson, Curt Pate and Josh Lyons showcasing their skills in gentle horsemanship while entertaining the audience. Anderson won a silver belt buckle, and all three received El Camino del Caballo jackets and a gift package from Rio Vista Products. Held in Fort Worth, Texas, Dec. 12-13, at Cowtown Coliseum in the Historic Stockyards, El Camino del Caballo was produced by Ride the Remuda Production, and hosted by Rick Lamb, of “The Horse Show” national radio program. Judges were horse experts Robert Moorhouse, Michael B. Richardson, Jack Brainard, Buster McLaurey and Dr. Bob Miller.